Here's what Rickie Fowler will be wearing this week at the Open Championship. It's part of PUMA Golf’s Autumn/Winter 2013 Collection. Apparently the people over at ESPN have figured out Rickie is actually color blind hence the sometimes "bright" outfits, see Sundays orange outfit. Really like the look on Thursday with the Tech Plaid 5 Pocket Pants. What are your thoughts? 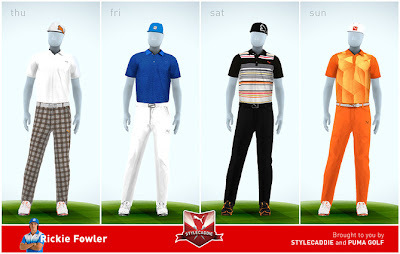 John Anderson may have finally figured out why Rickie Fowler wears so many bright-colored outfits.